This week has made some things very, very clear to me in terms of my running and overall fitness. It’s been a good breakthrough for me and I’m excited to share more about it! We didn’t have anything planned for Sunday. It was just a day of hanging around, cleaning up and getting ready for the week. Sometimes, those down days are just the thing. My original plan was to go to boot camp, but Mr PugRunner wanted to run four miles around 8:00 AM because of how the day’s weather was shaping up and I asked him to wait for me to get home from carpool so we could go together. He was a little concerned about our different paces, but I was happy to adjust and work with his intervals for the chance to spend those miles together. I planned to do five, and we split at just over three. For the first three, we did 2:00/1:00 intervals, and when we went our separate ways, I returned to my regular 2:30/1:00s. It’s been a long time since I completed five miles in under an hour. I pushed it hard towards the end, but it worked out well. And I loved running with Mr PugRunner. It was a nice way to spend some time together and I hope we can manage it a little bit more. This was a me day. I haven’t spent any time taking care of myself, and my hair was in desperate need of attention. I needed a trim and shaping, highlights and I was also in need of a huge change. Loving this subtle touch of magenta. It has faded a little, but my stylist is going to touch it up for me. It’s just what I needed and I can’t wait to try other colors in the future. I was so ready to be back at boot camp. And it was a great class. The instructor mixed in a bunch of great exercises on a variety of machines, and I fell in love with doing hyperextensions. It was one of those things where I thought there was no way I was coordinated enough to pull it off, but I was wrong. Yay! In the afternoon, I took little man to a playdate, while Mr PugRunner brought Molly to the vet. Our little 10 year old pug is getting older, and since her birthday, her age has been more evident. She has some struggles getting her hind legs under her and sheDr R wanted to see her for a physical so he could make appropriate recommendations for ways to help her. Diagnosis? Some arthritis, along with the thinning of a few of her vertebrae. She is not in any pain, but there are some minor neurological effects from the aging of her spine. Primarily, the reflexes in her back left leg are not quite as on point. She will be getting a course of Adequan injections to help build up some cushion in her joints, as well as periodic laser therapy. So far, she’s not impressed. I decided to switch things up a little and move my intervals to 3:00/1:00. It was pretty tough, but there were results. I have to wonder if it’s the cooler weather or just the extra motivation that’s leading to this, but I’ll take it. TGIF! I had some plans that fell through, but that’s ok. It was the day of little man’s Valentine’s party and we were going to volunteer. Little man chose these word search Valentines (free printable from Amazing Mae) with attached pencil. We helped the kiddos make their Valentine’s Day mailboxes and I even read a story to the class before dismissal. I also got a very special delivery from my boys: custom ice cream from ecreamery. I got up early to pick up heart-shaped donuts for the family. Mr PugRunner took little man to karate so that I could pre-register for my third year of the Space Coast Half Marathon. This year, I am eligible for the Milky Way Challenge medal, and I couldn’t be more excited. Little man was invited to test for his orange belt this month, so we are looking forward to that. Afterwards, we went to a gourmet taco place for lunch and then it was on to the baseball fields for practice. It was a long, wonderful, busy week. I am feeling incredibly strong and capable. The goals I have in my head seem well within reach, and I love that feeling. In a lot of ways, marathon training left me feeling defeated and drained, and now that it’s all over, I feel rejuvenated and enthusiastic again. It’s a good place. What’s the craziest thing you ever did to your hair? It looks like your week was awesome, congrats on the 3:1 intervals that’s so cool! 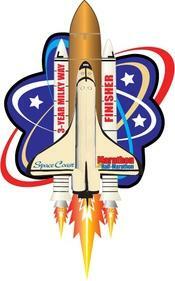 That’s so awesome you are going to run Space Coast for the third time! We have a family friend considering it for his first marathon, would you recommend it? I have a bunch of friends who have done the full and love it. The last half of the marathon is on the same course as the full, so I know that part is awesome. The only “problem” is that it does get crowded out there. The road is narrow, and even though they have capped the registration, there are still congestion issues. It doesn’t bother me really, but there are people who get very upset about it. Great crowd support, awesome bling, flat and scenic course, super fun post-party. It’s honestly my favorite race. I am in the middle of getting back to running after a foot injury in November, so I’m making myself work slowly back up in mileage. I am back up to 5 miles as my longer distance, and I’m making myself go for at least a mile every single day. Today will be Day 8 of my #RunStreak, and I managed a full 7-day streak before breaking it on purpose on Day 8. I’m really liking not having full rest days right now, as it keeps me from being complacent and really pushing myself to get back to where I was. I can’t wait to get back to my 30+ miles a week, though I doubt that will be until I can go outside regularly. The treadmill just isn’t conducive to long runs for me. I go insane. Also, love your hubs’ Batman shirt. Man after my own heart, right there! BJ @ Geek Fitness recently posted…What Are You So Afraid Of? Injuries are so hard 🙁 And I agree on treadmills. I can barely go a mile on one – I can’t imagine having to tough it out for more than that. Congrats on your streak! You’re doing great! I had really, really, really short hair at one point in my life. I actually really liked it, but growing it out was wretched! 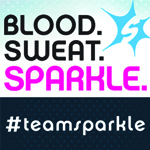 Those definitely sound like some good workouts, and congrats on the 5k time!! I love your Garmin!! What is the style of it? (Although I could never trade in my beloved Garmin haha). Thank you! It’s the Forerunner 220. Mr PugRunner got it for me around our anniversary in November and I love it to pieces! I spent the weekend in southern VA with friends, so I barely did any training (just some burpees & the like in the hotel room on Sunday morning), but I checked my email & saw that I have 8 weeks until my next full marathon. I haven’t run since Thanksgiving. Um, I should maybe do something about that. Anyway, I ended up taking this morning off of my scheduled strength training because of the cold (seriously, it’s cold here . . . nevermind not going outside, I couldn’t even hang out in my basement because I was shivering as soon as I got down there), so I started the 300 workout over lunch today — my hope is to run on Tuesdays & Thursday mornings when the weather permits (otherwise spinning — and then doing some form of cardio over lunch), doing a dual strength-training workout on Mondays/Wednesdays/Fridays (pull-ups, dips, pistol squats, and kettlebell swings in the mornings, 300 workout over lunch). If I continue that until April — well, I’ll, at least, be strong when it comes time to run over the hills. Sheesh! That IS cold! I can’t even wrap my head around that. Your plan sounds incredibly sound, though and I’m sure you’ll be back up to speed in no time, once the weather warms up enough to permit it. Good luck! Sounds like a great week! What flavors are the ice cream?! Love the pink in your hair. I had purple extensions a few years back, so fun! I’m desperate for a salon appointment… I really need to schedule that. Awesome job with your runs! I really think I should try interval running. I always feel rejuvenated after a little walk break, but feel guilty taking them. Maybe if they’re planned I’d feel less guilt? I’m really excited to say I’m getting back to training! I got the treadmill put together last Wednesday evening, then ran Thursday and Sunday. It was supposed to be Thursday and Saturday, but I did a lot of snow shoveling and ran out of steam. It happens! 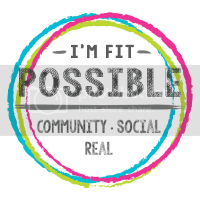 Stacie Seidman recently posted…Fun New Subscription! Ice cream flavors include chocolate gelato, chocolate chip gelato, chocolate cake with fudge and brownies and a chocolate chocolate chip. Nom. I think intervals are great. I don’t think I would be as interested and dedicated as I am without the ability to take little walk breaks. Plenty of people do it and with great levels of success. If it works for you, no need to feel guilty! Yay! So glad your treadmill is together and you are back at it! Hope that snow lets up soon! It sounds like your training is going great! I really wanted to run Space Coast, but the timing isn’t great this year. Thanksgiving weekend is hard. It’s just something I love doing, and it’s worth the extra rushing around. This is the spot of my first half marathon, and it holds a very, very special place in my heart.